I am a member of the Breckland Astronomical Society in Norfolk. The society has a 20" AltAz Newtonian reflector which is computer controlled, a 9.25" Celestron SCT and an 8" Celestron SCT, both of which are on GOTO mounts, and a 4" Vixen refractor. 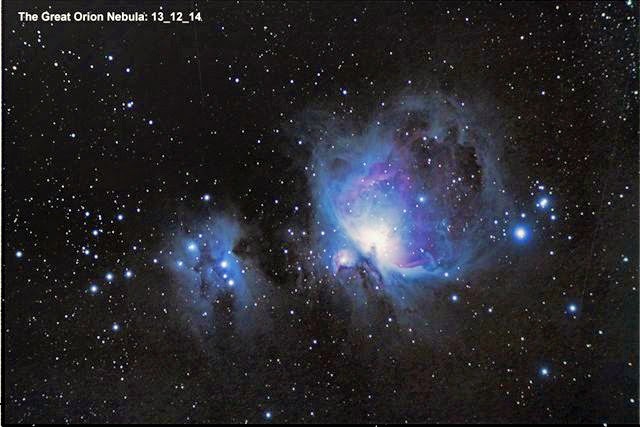 In addition we have recently purchased a DMK planetary imaging camera and an Atik 383 deep sky camera..We have a very active astrophotography group that meets on Tuesdays at the observatory. In addition to using the society's equipment, I have a 10" Meade SNT for deep sky and planetary imaging and a QHY5L-II camera primarily for planetary imaging. For digital imaging I use a Canon EOS500D DSLR camera. I recently purchased a Robtics ED80 refractor for both deep sky and planetary imaging. the pier assembly was made up of a metal cylinder with fins to make it more rigid and the two plates for the mount assembly. Paul did all the welding and Nick the finishing work. . The frame of the observatory. Sons Paul and Mark with grandson Jack building the frame for the main housing. main building taking shape, inner walls insulated and finished with 25 mm ply. Finally finished in October after 5 months of intermitent effort. The flat roof and dome kits were from Pulsar Observatories..
Saturn was imaged with a ZWO ASI120MC-S planetary camera on a 10 inch Meade SNT with a x4 Imagemate. Not the best of images as Saturn is very low in the sky this year and barely above 15 degrees altititude. The planet is tilted sigificantly this year showing a wide ring display. 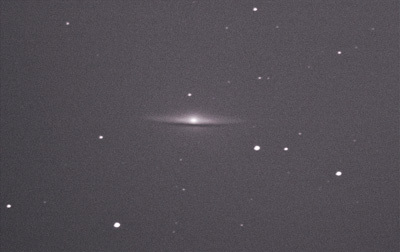 The image was taken on the Breckland Astronomical Society's Skywatcher ED102 on the iOptron mount. Canon 500D with a x4 Imagemate. Total of 12 Raw images at ISO400 and 1/500sec. Processing done with Registax 5.1 and Photoshop Elements. 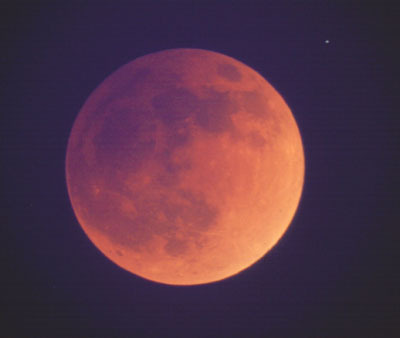 The image was taken with a Canon 500D DSLR and a 200mm Tamron telephoto lens set to 160mm at ISO800. 12 RAW images were taken for 3 minutes each and processed with DeepSkyStacker and Photoshop Elements. 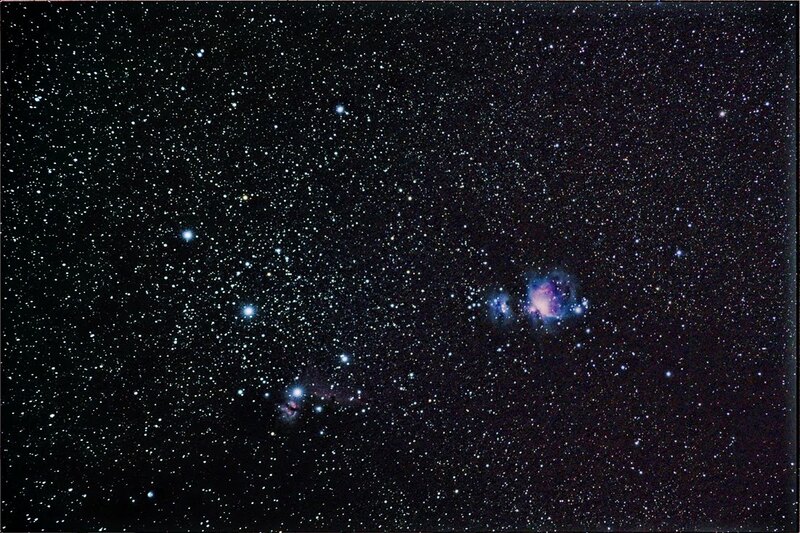 Additional processing was done by Dan Self to remove a light gradient.The Image shows the central part of the constellation with Orion's Belt and the Great Orion Nebula. Close to Alnitak can be seen the Flame and Horsehead Nebulae. 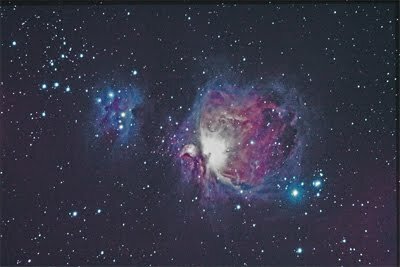 The Orion Nebula is some 1,600 light years distant with a diameter of 30 light years. the Rosette Nebula is located in the constellation Monoceros near Orion, It is 2,600 light years distant and has a diameter of 130 light years. 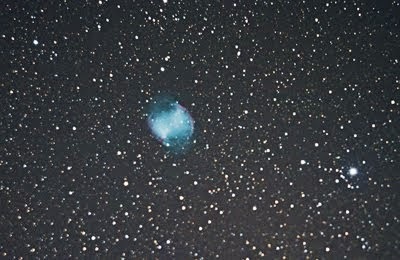 It was imaged with a Canon 500D on my ED80 . 18exposures of 90 seconds each at ISO1600.. 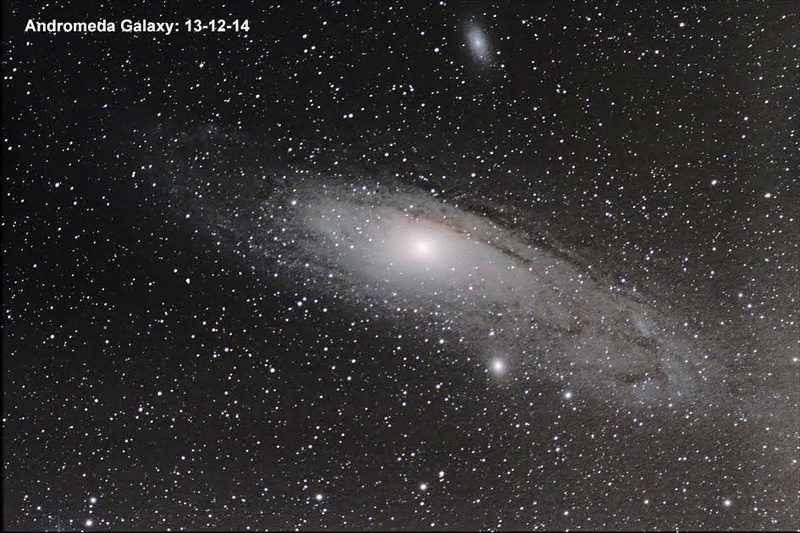 The final processing was done by Richard Harmon using PixInsight. 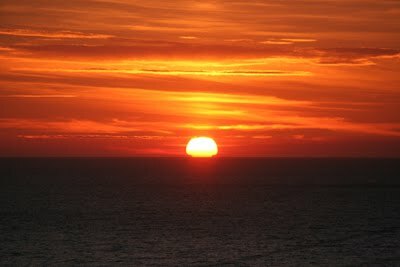 The image was taken with my ED80 and Canon DSLR 500D. 16 exposures of 2 min. 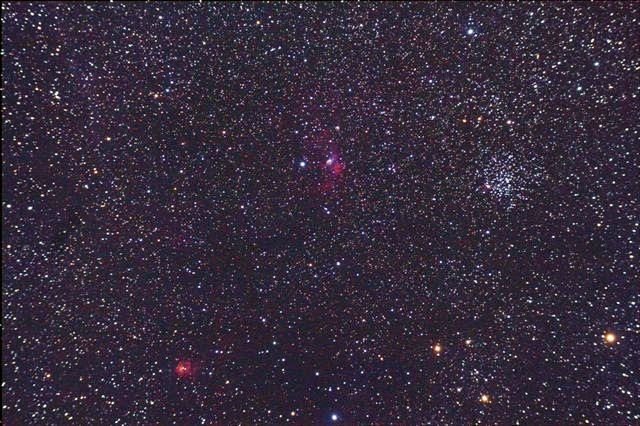 each at ISO1600 processed with DeepSkyStacker.The image shows the open star cluster M52 in Cassiopeia along with the Buuble Nebua NGC 7635 and the reflection and emission nebula and star forming region NGC 7538 in Cepheus. Having taken off the Meade 10" SNT off the LXD mount to change the focuser to a Crayford type, I put the Robtics ED80 on the mount and waited for a good night to test out the polar alignment. Saturday the 13th turned out to be clear so went for a few favourites. I used my Canon 500D at ISO800 and took 12 x 120 second exposures of each, processed with DeepSkyStacker and Photoshop Elements. 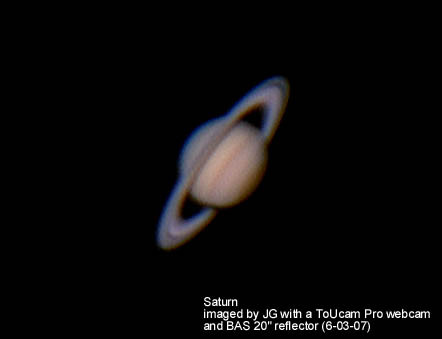 saturn was imaged with a QHY5L-II planetary camera with a x4 Imagemate on a 10" SNT. Not the best of images as Saturn is low in the sky this year and the atmosphere has not been all that good. 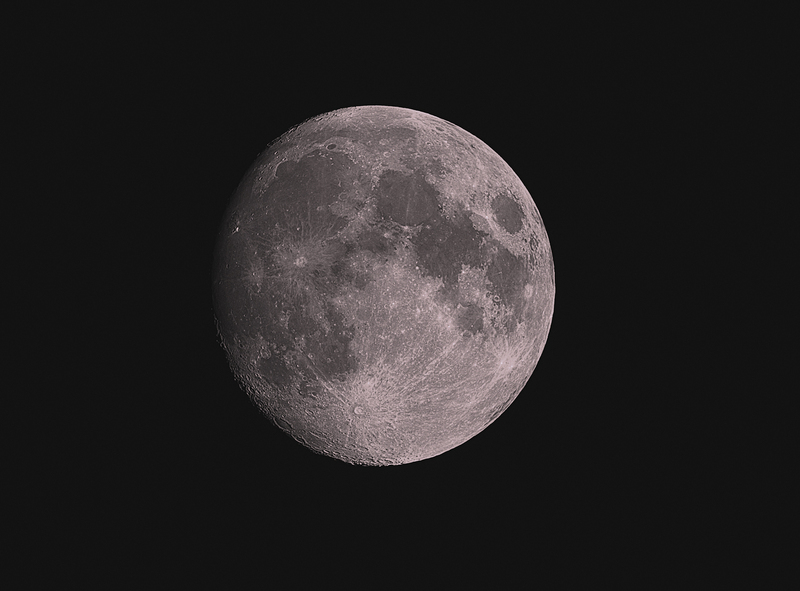 Hard to resist a full Moon shot, this was taken with a Canon 500D DSLR with live focus to get a nice sharp image. 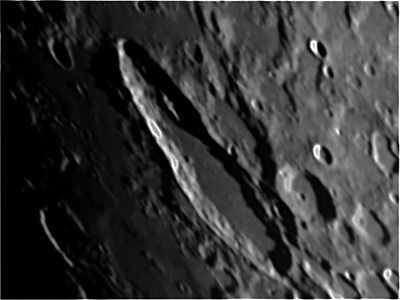 The crater at the bottom is Tycho with its extensive ray system. . 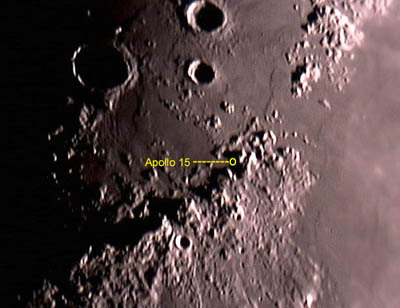 The image was taken with a Coronado Maxscope 40 and x2 Barlow lens with a QHY5L-II planetary camera. The Sun was setting at that time and the image was an opportunistic shot takern outside the Breckland Astronomical Society's observatory. 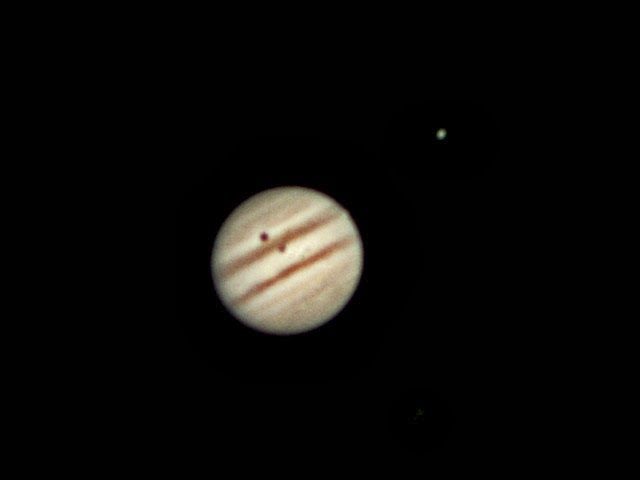 Jupiter with the shadows of Io and Ganymede was imaged with my QHY5L-II camera on an ED80 with a X4 Imagemate. 1,000 frames were taken at 24fps. Ganymede is on the upper right. 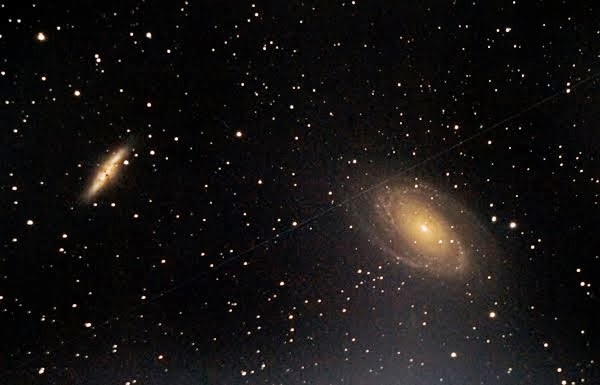 M81 and M82 are two galaxies in Ursa Major, they were imaged with my canon 500D on the 10" SNT, total of 12 exposures of 100 sec. each at ISO1600. As the moon was about, the background is a bit light. M81 is an Sb spiral some 70,000 light years diameter, M81 is more edge-on with a diameter of some 35,000 light years, both are about 12 million light years away. The Dumbell is a very bright nebula in Vulpecula with a dimension of 8x5 arc.min. It is approx. 1,000 light years away and has a 14mag. central star. 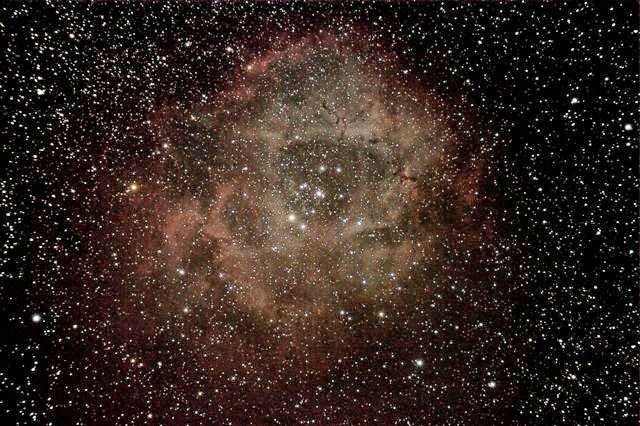 I imaged it with my Canon 500D on the 10" Meade SNT. 12 exposures of 90sec. at ISO 1600 and processed with DeepSkyStacker and Photoshop Elements.. 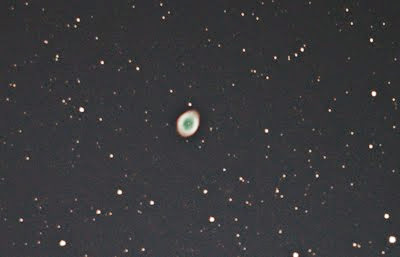 The ring nebula in Lyra is a planetary nebula some 2,000 light years away. at its centre is a mag. 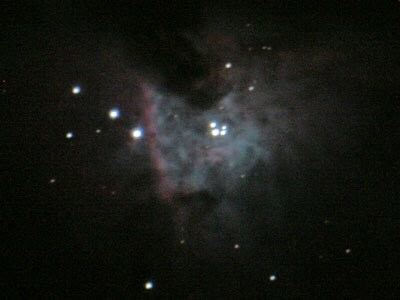 15 star which produced the nebula and is now a white dwarf. The nebula is about one light year in diameter. 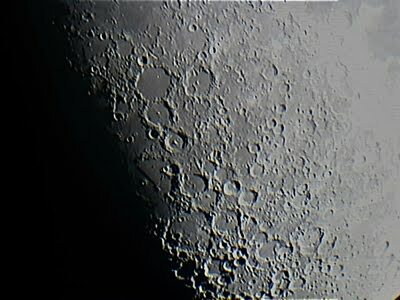 the image was taken with a Canon 500D on the Meade 10" SNT. 12 exposures of 90sec. 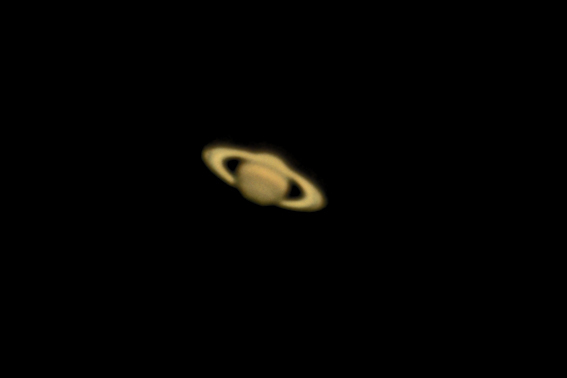 each at ISO 1600..
Saturn, Imaged on April 21, 2013, 18:00 hrs. 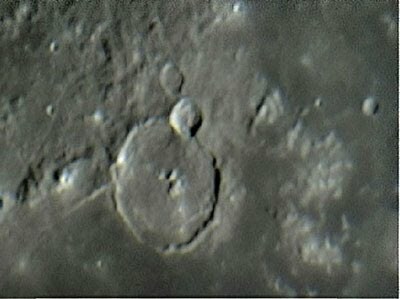 This was imaged with a new QHY5L-II planetary camera on my 10" Meade SNT with a x2 Barlow lens and yellow filter. 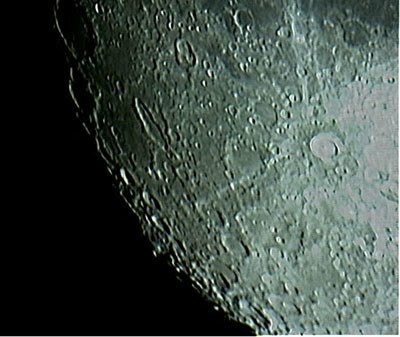 Imaged with a Philips ToUcam Pro webcam on a 80mm ED80 with a x2 Barlow lens. 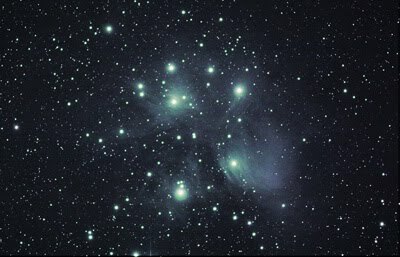 This image of the Pleiades star cluster was taken at first light from my new observatory with a 500D Canon DSLR on an ED80. Exposure was 11 x 150 seconds at ISO 800 processed with Deep Sky Stacker. The Pleiades is an open cluster of young stars also known as the Seven Sisters, it is located in the constellation of Taurus. This cluster is only about 100 million years old and is made up of spectral Class B blue giants,. 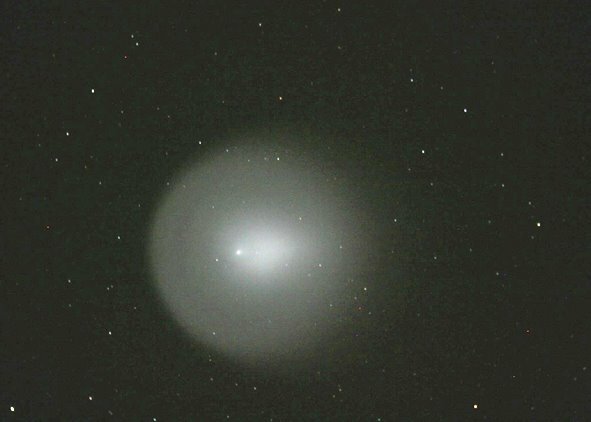 They are embedded in a cloud of interstellar dust which is illuminated by the stars' brightness. They are located some 380 light years away. The Pinwheel galaxy is a face-on spiral in Ursa Major. 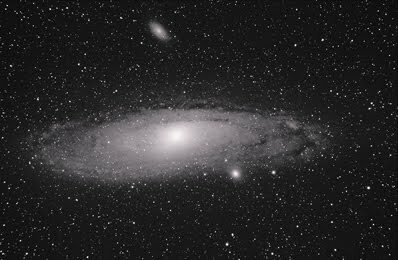 It is about 27 million light years away and has a diameter of 170,000 light years so it is larger than our Milky Way galaxy. 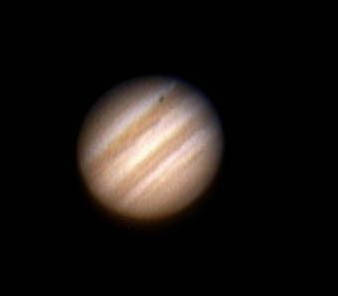 I imaged it with my Canon 500D on a 10" Meade SNT. 16 x 90 second exposures at ISO800. Processing was with DeepSkyStacker. 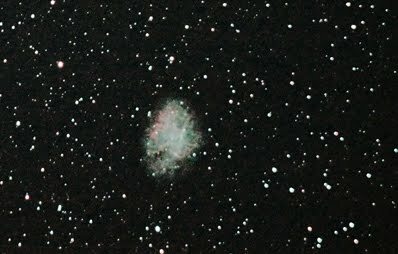 Also shown is the remnant of the supernova from August of 2011. 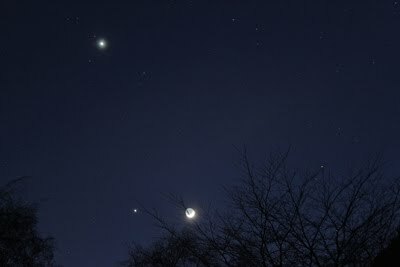 Crescent Moon, Venus and Jupiter, March 25, 2012. Both images taken on the Breckland Astronomical Society's 9.25" SCT with a x4 Imagemate, They show the Valles Marineris region of Mars and the North Polar Cap. Image (a) 21:34 hrs, was taken with a Philips ToUcam Pro webcam and image (b) 22:13 hrs, with a DBK camera. 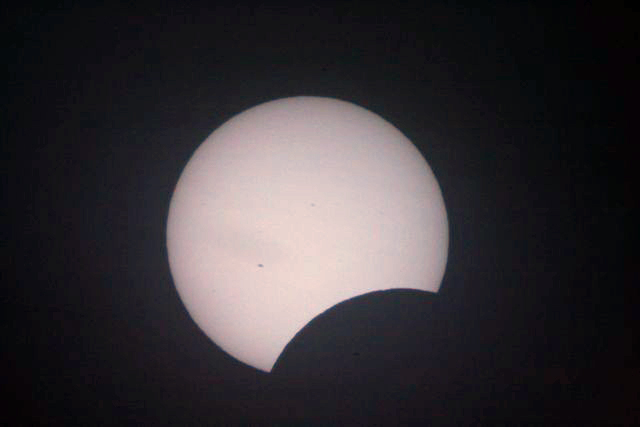 Processing done with Registax 5.1. The Crab is the remains of the 1054 supernova. 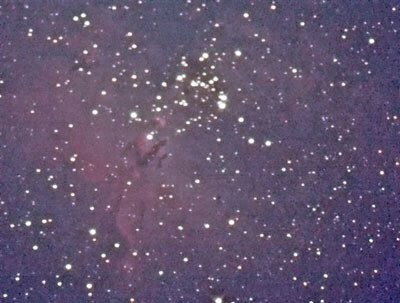 it was imaged witjh a Canon 500D on a 10" Meade SNT. 6 exposures of 60 seconds each were taken at ISO3200 with a Baader UHC-S filter. Processing was done with DeepSkyStacker and Photoshop Elements. 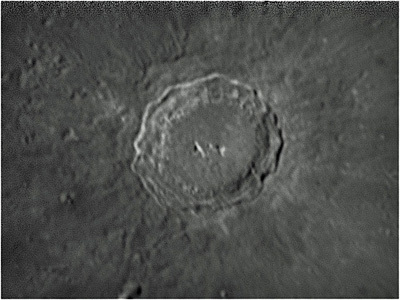 Imaged with the DMK planetary camera on the society'd 2-" reflector and processed with Registax5.1. 06-12-2011. 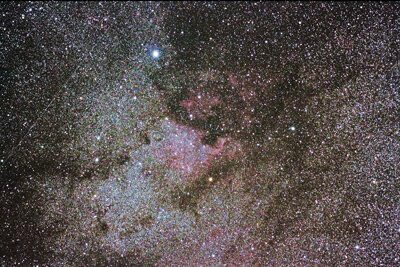 The image was taken with my Canon 500D with a 200mm telephoto lens piggybacked on an ED80 on an LXD55 mount.. Three exposures of 10 minutes each along with one dark at ISO800. The images were processed with DeepSkyStacker and Photoshop Elements. Mercury and Jupiter, March 16, 2011. 19:55hrs. 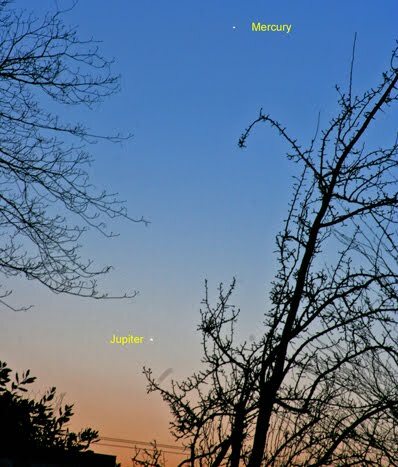 This image shows both Mercury and Jupiter as Jupiter is about to set over the western horizon. 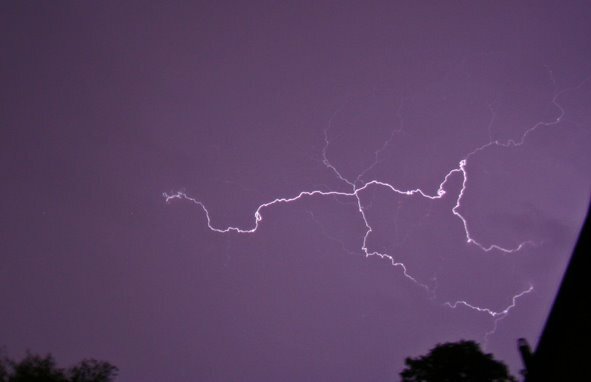 It was imaged with a canon 350D, 4 second exposure at ISO400. 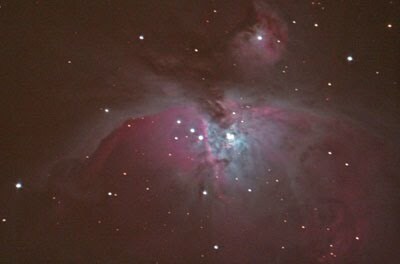 Imaged with a canon 500D DSLR on a Meade 10" SNT. 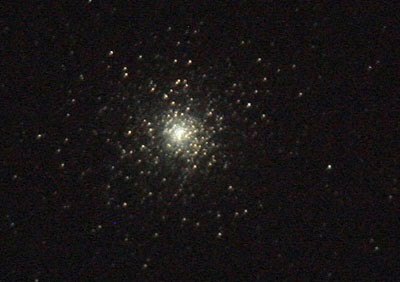 20x90second exposures at ISO800 processed with DeepSkyStacker..
Imaged with a Canon 350D on an ED80 with a Baader UHC-S filter. Exposure was 220 seconds at ISO1600. 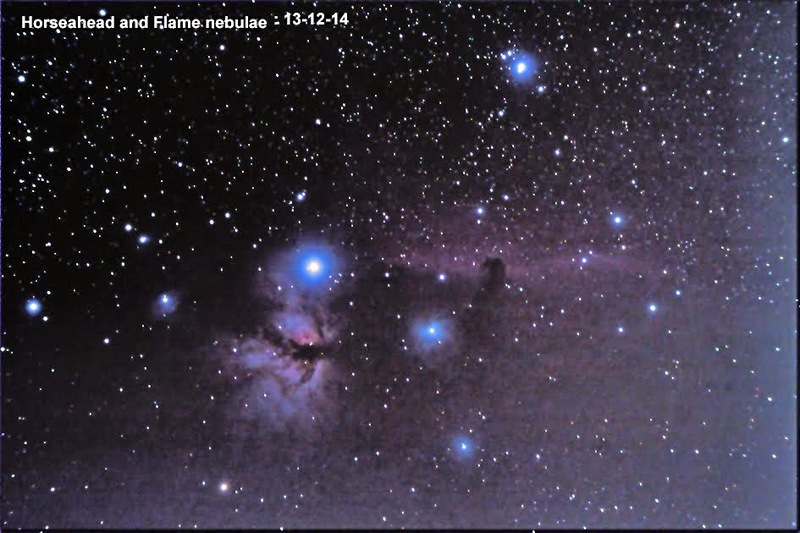 The Flame and Horsehead nebulae ar located in Orion close to the star Alnitak. 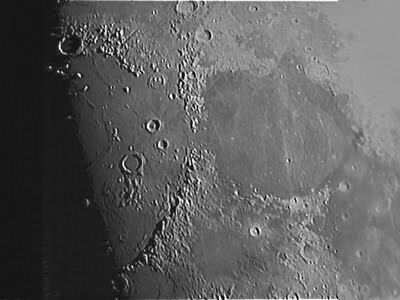 The image was taken with a Canon 350D on an ED80 with a Baader UHC-S filter. Exposure of 180 seconds at ISO1600 was used.. 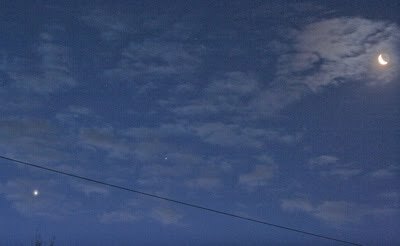 This image shows a crescent Moon with Venus and Spica. 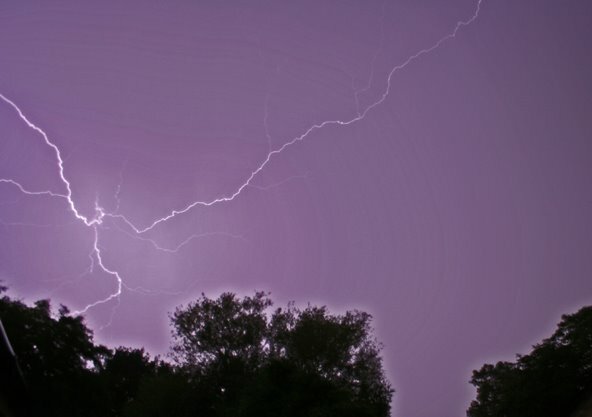 It was imaged with a Canon 350D with a 1 second exposure at ISO800 and f/5.6. MOON AND VENUS 15-06-10, 22:50 hrs. 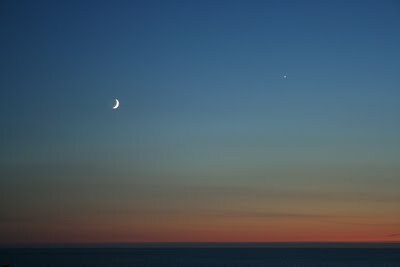 This shot of the crescent moon and Venus was taken from a high elevation overlooking Cardigan Bay, west Wales. Canon 350 DSLR, ISO800 and exposure of 0.4 sec. This image was taken from Aberaeron on the Cardigan coast, Canon 350DSLR camera with 200mm telephoto lens at ISO800, 1/4000sec. at f/6.3. 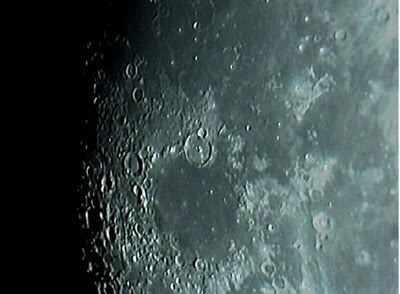 Moon craters central area 21-05-10 21:41 hrs. 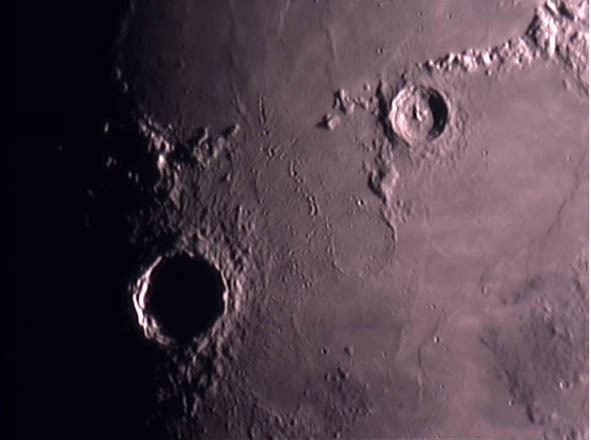 the craters imaged are Ptolemaeus, Alphonsus and Arzachel close to the terminator with Mare Nubium to the left in the shadow.The image was taken with a Philips Toucam Pro webcam on a Robtics ED80. 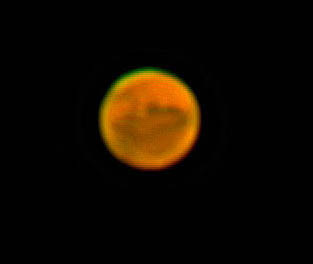 Mars captured with a Philips ToUcam Pro webcam with a x4 Imagemate and a x1.6 AsrtroEngineering magnifier on my 10" Meade LXD55. The image was taken on January 26th. The image shows the north polar icecap. 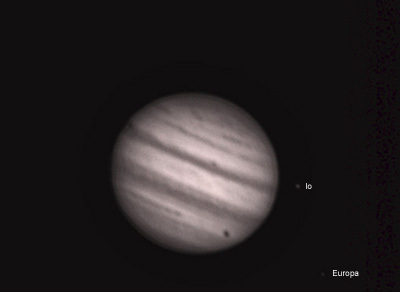 The avi frames were processed through Registax and Photoshop. 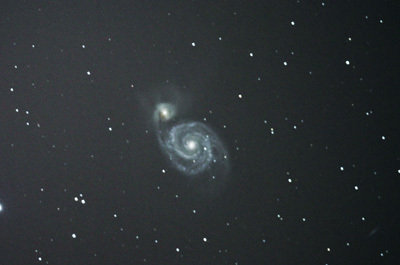 The image was taken with the Breckland Astronomical society's 20" Alt Az reflector and a Canon 350D DSLR camera at ISO800 and exposure of 20 seconds. some additional processing using Photoshop. 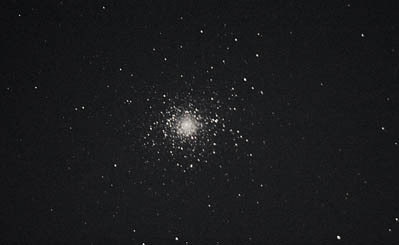 M15 is a dense globular cluster in Pegasus. 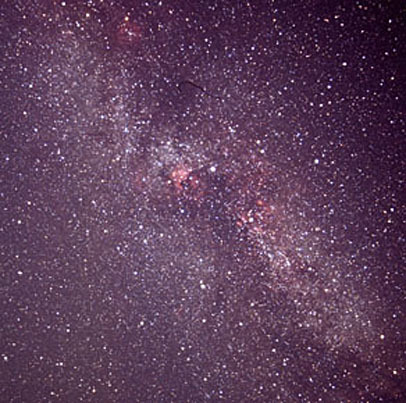 It is estimated to have between 50,000 and 2000,000 stars within a diameter of some 200 light years and is at least 13 billion years old. 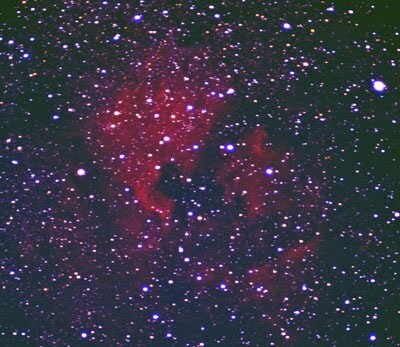 it was imaged using a Canon EOS350d DSLR camera on a 10" Meade LXD55 SNT. The exposure was 18 seconds at ISO800. Lightning strikes over Diss in Norfolk taken on August 07, 2008. Imaged with a Canon EOS350DSLR and 18mm lens at f/5.6 and ISO400. Shutter held open for approx. 10 second intervals. The partial solar eclipse Imaged with a Canon EOS350D using afocal projection through a 40mm eyepiece on a 4.5" Newtonian reflector. 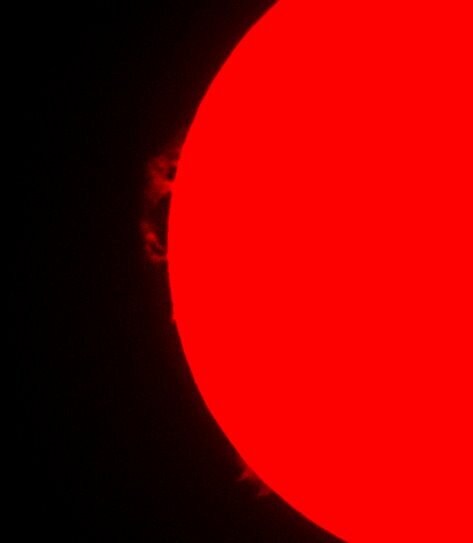 note the two sunspots. M82 - the Cigar Galaxy in Ursa Major. 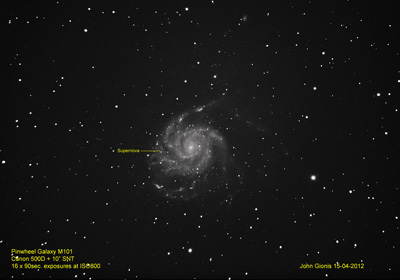 Imaged with a Canon EOS350DSLR on a 20" AltAz Newtonian reflector at prime focus. 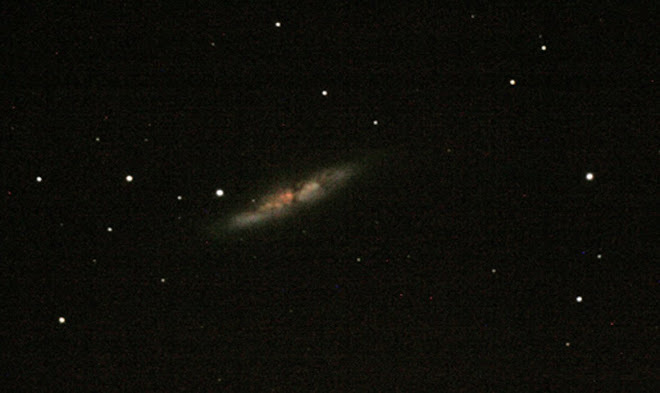 Exposure of 22 seconds at ISO800.M82 is 35,000 light years in diameter at a distance of 12 million light years. 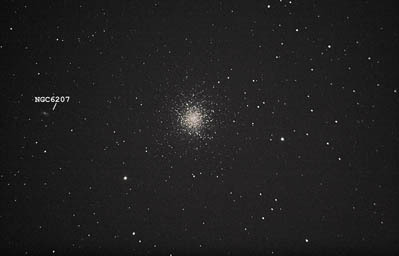 Imaged with a Canon EOS350D at ISO800 on a 10" Meade LXD55 at prime focus. Exposure of 30seconds. 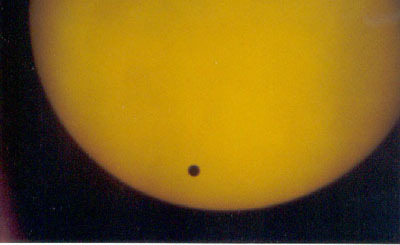 Transit of venus across Sun's disc. Imaged with an Olympus OM1 and 15mm eyepiece projection through a 4.5" Newtonian reflector with a combination of Baader solar filter and yellow filter. 8-06-2004. 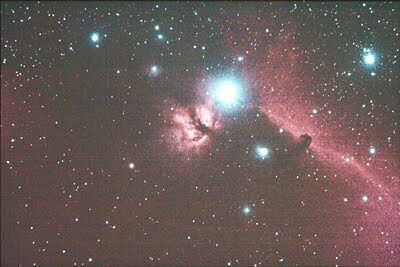 Imaged with an Olympus OM1 and Fuji Sensia 400 slide film on a 9.25" Celestron SCT. 10 second exposure.